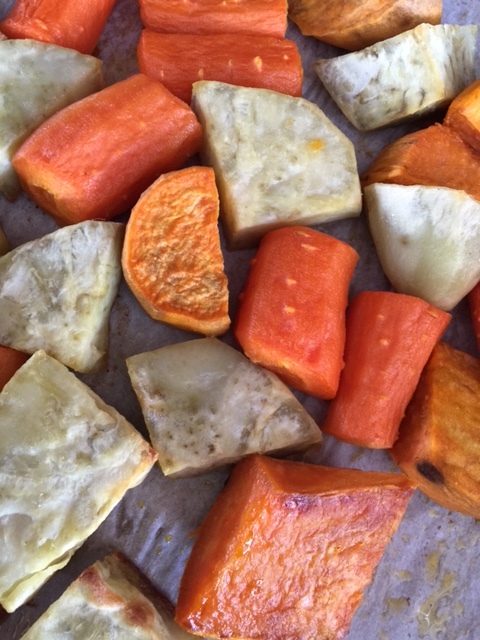 Although we are vegetable farmers, there are few things we enjoy more than a tender succulent roast, slow cooked in the oven (or crock-pot) that yields multiple meals. We are so fortunate to have easy access to beautiful grass-fed beef and lamb, along with milk-fed pork at the Fulton Street Farmer’s Market where we are seasonal vendors. In fact, Karin Uebbing from Woodbridge Dairy Farm in Byron Center, Michigan and I have decided to collaborate on a cookbook. Bits, Bones and Pieces will highlight the many ways to enjoy beef and pork; even those unusual cuts that sometimes baffle us. During this process, I am learning a great deal about dairy farming and raising healthy livestock, and Karin (not to mention her family) are expanding their culinary horizons. It certainly seems like a win, win! Karin, who is known for her straight forward assessments of how she sees things has said, “All farms are like humans; no two are exactly the same and one type vs. another type is not good or bad, simply different.” Woodbridge Dairy Farm is one of the many farms going the extra mile by making the decision to build a sustainable, well-run farm that uses traditional methods that include the elimination of chemicals and pesticides, and utilizing pasture rotation for an environment that produces healthy livestock. As a customer, I enjoy knowing where my meat is coming from, as well as the satisfaction of supporting another farmer in their quest to produce a quality local product. Farmers are often passionate people to love to share their commitment to their farm and the customers they serve. They patiently answer question from folks who don’t necessarily know what they do, or how they do it. For them, big is not always better. In fact for many, quality is far more important than quantity. Preheat the oven to 275 degrees F. Dry roast with paper towels. Generously salt and pepper. Heat ghee in large Dutch oven over medium-high heat. Add the whole shallots to the pot, browning them on all sides. Remove the shallots to a plate. Throw the carrots into the same very hot pot and toss them around a bit until slightly browned, about a minute or so. Reserve the carrots with the shallots. Turn the burner on high and add a bit more ghee to the very hot pot (make sure your fan is on!). 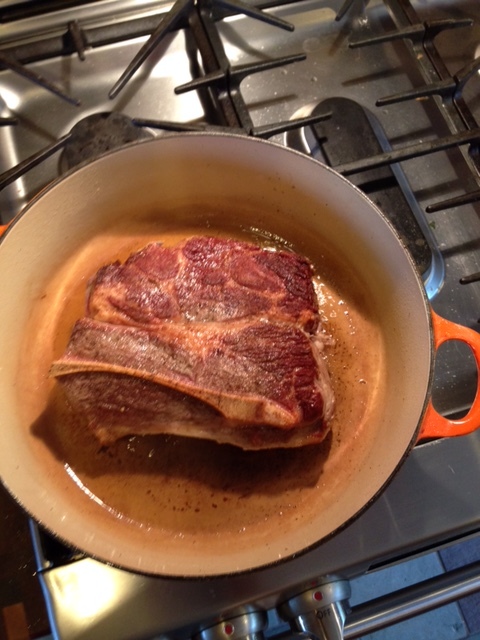 Place the roast in the pot and sear it for about 2 minutes on each side until it is nice and brown all over. Remove the roast to a plate. With the burner still on high, deglaze the pot with a red wine, scraping the bits from the bottom with a whisk. Add the beef stock. 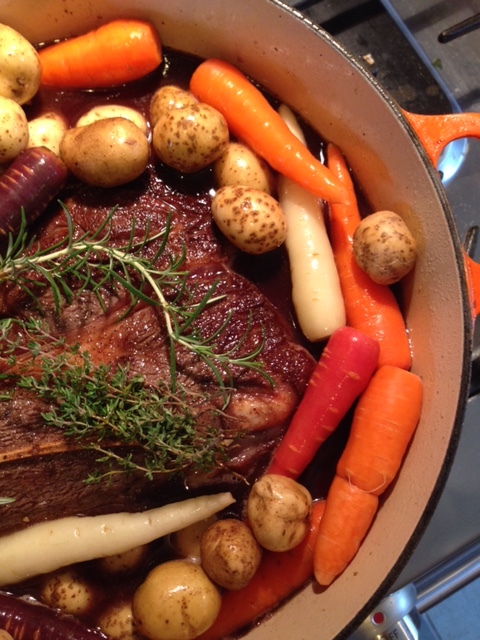 Place the roast back into the pot and top with the shallots, carrots, garlic, potatoes and herbs. Cover and place in oven for 3 hours. The roast in tender when it’s fall-apart tender. This can take up to 4 hours total. Serve with vegetables. Pass sauce. Initially, when we went grain-free, we thought it might be a difficult transition. Being foodies, we were anxious to understand the perimeters of this life-style approach and how we might use our creativity to still make food that excited us. When looking for inspiration, I often go to my collection of ethnic cookbooks. I was not disappointed; we love Middle Eastern, Indian and Mediterranean food. 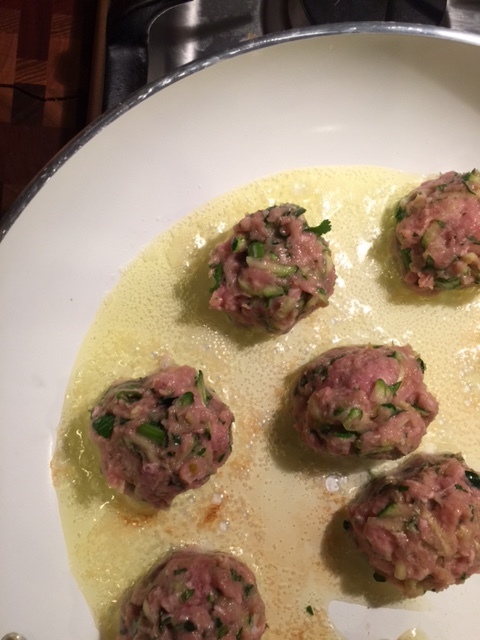 I was soon mixing up a concoction of ground turkey, shredded zucchini, herbs and garlic into small meatballs that were first browned in a pan, then finished in the oven. Topped with a soothing sauce of homemade yogurt, sour cream, lemon juice and sumac, they are perfect as an appetizer or served on top of a salad of tomatoes, cucumber, feta and sunflower sprouts. Moral of the story: change doesn’t have to be difficult, and little things mean a lot. 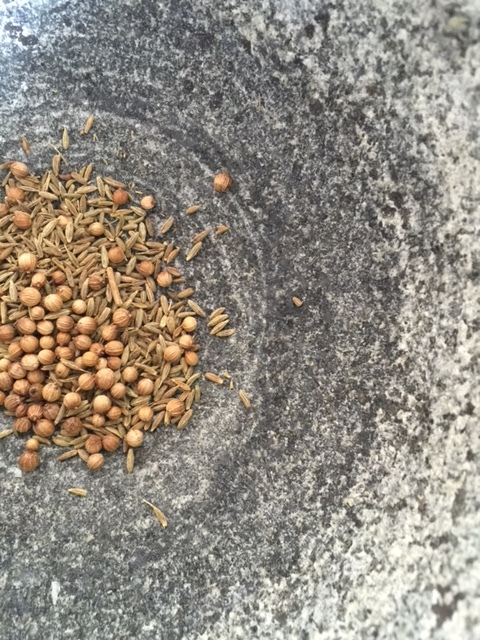 First make the lemon-sumac sauce by placing all the ingredients in a small bowl. Stir well and chill until needed. Preheat oven to 425 degrees. In a large bowl, combine all the ingredients except the ghee. Mix with your hands (you will really get a better result) then shape into small meatballs about the size of golf ball. Melt the ghee in a 12 inch skillet on medium-high heat. Add meatballs, making sure to leave room between them. Saute on each side until browned, about 4 minutes per side. 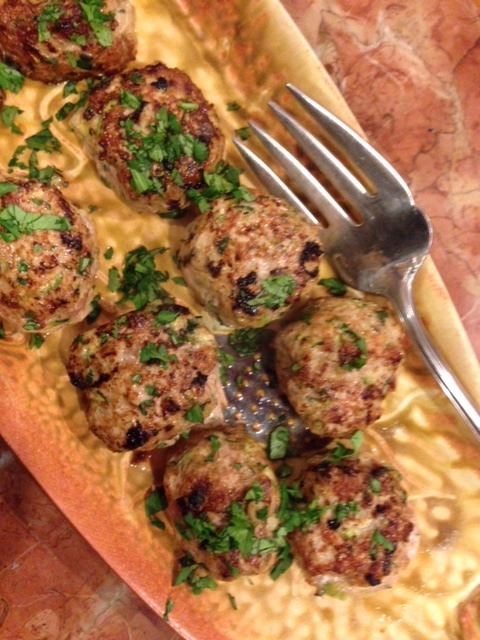 Place browned meatballs on a cookie-sheet lined with parchment paper. Place in oven and bake for 7-10 minutes. Place on platter and pass sauce; or place on top of salad. It’s been an interesting winter. Powerful storms have dropped feet of snow, only to melt during the next cycle of upward temperatures. Regardless of what goes on outside, I love this time of the year. We savor indoor activities like reading, contemplation, projects and weekend visitors. We vacillate between soups or stews to gratins and roasts. We eat differently in winter. I tend to cook food that takes more time and intention. Is there anything better than the aroma of Sunday dinner wafting through the kitchen? One of my favorites is stuffing a pork loin with porcini mushrooms and dried apples. So enjoyed by my family, it has replaced our traditional turkey at Thanksgiving. It’s a perfect dinner for company, when you want to create something special. Each spiral slice looks beautiful on a plate. Fortunate for us, we have options for great grass-fed beef and milk-fed pork at the Fulton Street Farmer’s Market in Grand Rapids, Michigan where we are seasonal vendors. With high-quality meat, this is a entree worthy of the season. Place dried mushrooms and dried apples in separate bowls. Add 1 cup boiling water to each bowl. Let mushrooms and apples soak until very soft, about 30 minutes. Strain mushrooms. Cover and chill mushroom soaking liquid. Drain apples, discarding liquid. Finely chop mushrooms and apples, combine in a small bowl, and set aside. Meanwhile, blanch kale in boiling salted water for 1 minute, until wilted. 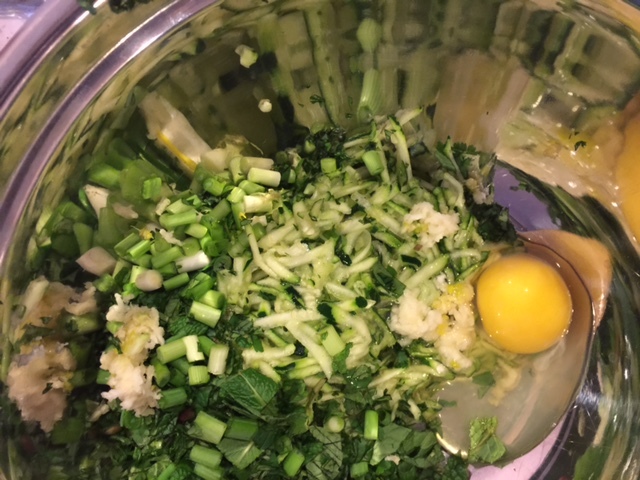 Using tongs, transfer kale to a bowl of ice water. Drain on paper towels, once cooled completely. Remove any large ribs. Melt butter in a large skillet over medium heat. Add onion; cook, stirring often, until soft and golden, about 8 minutes. Add mushrooms and apples; cook, stirring occasionally until flavors meld, about 5 minutes. Stir in garlic, thyme and rosemary; cook for 1 minutes. Add cognac and cook until liquid is absorbed, about 1 minute. Salt and pepper to taste. Transfer to bowl, let cool completely. Add ground pork and combine well. Open butterflied pork loin, cover with plastic wrap. (If your pork loin in not butterflied, do the following: Put pork loin on a work surface and beginning along one long side, cut 1/2 inch above the underside of the loin. Continue slicing slowly inward, pulling back the meat with your free hand and unrolling the loin like a carpet, until the entire loin is flat.) Using a meat mallet, point to an even thickness. 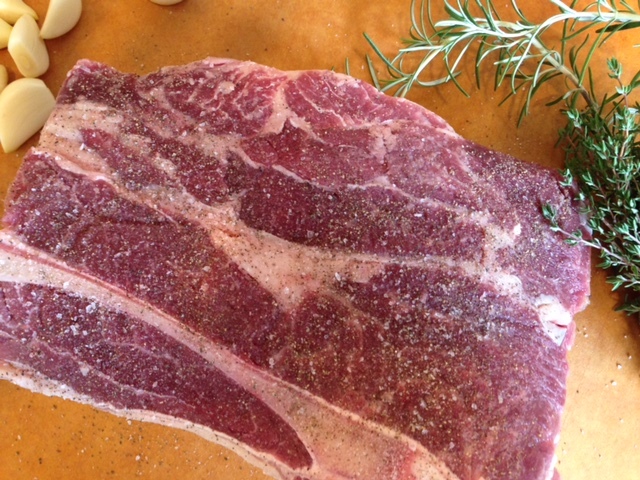 Uncover pork, season with salt and pepper. 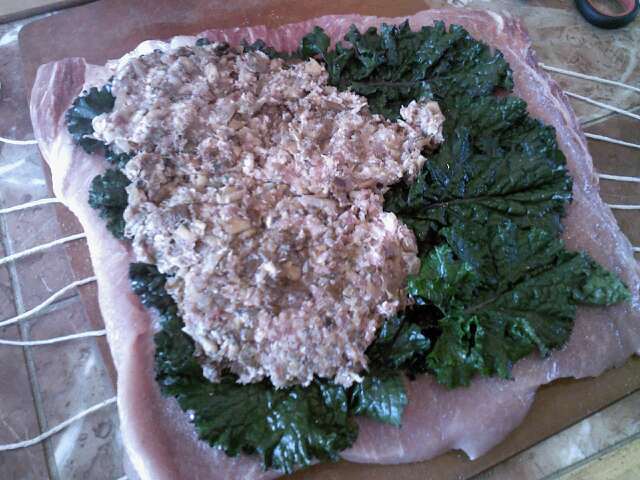 Place kale leaves on top of loin in an even layer, overlapping as needed and leaving a 1 inch border. Spread filling on top of kale. Roll pork into tight cylinder. 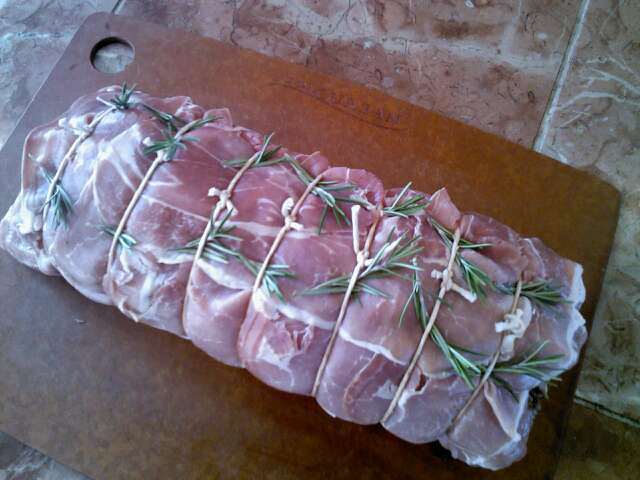 Wrap one layer of prosciutto around roast. Tie roast securely with kitchen twine in 1 inch intervals. Tuck rosemary sprigs under twine, spacing apart. Roast can be made 1 day ahead. If making ahead, cover and chill., then let stand at room temperature for one hour before continuing. Preheat oven to 400 degrees. Place apples in a roasting pan. Melt 1 Tbsp butter with oil in a large skillet on medium-high. Brown pork roast on all sides, about 5 minutes total, then set on top of apples in roasting pan. Add hard cider and 1/2 cup of water to skillet and bring to a boil, scraping up any browned bits in pan. Pour mixture into roasting pan. Roast pork until an instant-read thermometer reaches 140 degrees, about 1 hour and 40 minutes. Let roast rest for at least 20-30 minutes. Place roast on platter. Reserve apples from roasting pan; spoon off fat from juices in pan. Place pan on top of stove over medium-high heat. Add chicken stock and reserved mushroom liquid, leaving any sediment behind, and cook, scraping bottom of pan to release any browned bits, until slightly thickened; about 5 minutes. Whisk in remaining 2 Tbsp butter and season to taste with salt and pepper. Strain sauce; slice pork. Serve apples and sauce along side pork. Don’t we all know when certain combinations go together? Like tomato and basil, greens and eggs, steak and mushrooms, bacon and everything! Each day can be an adventure in eating! When we eat the magic that each season offers there are combinations that are savory surprises. This week we needed to use some of the acorn squash we were storing. We thought a pairing with chicken thighs was a simple, yet delicious combination. Quick, easy and satisfying, you can put this together in no time and your family will love the results. 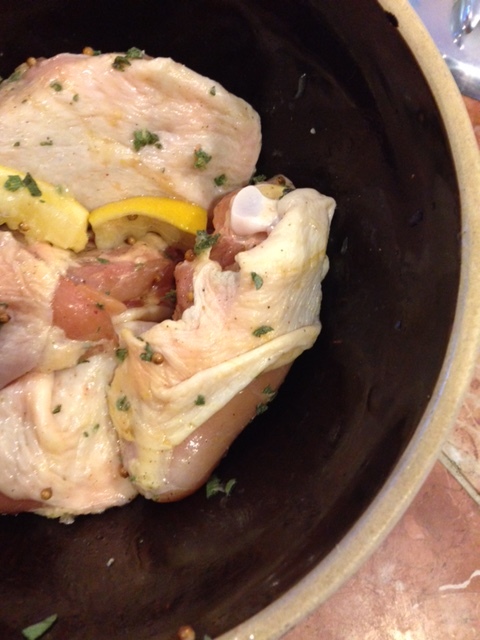 In a a large bowl, toss chicken thighs with lemon slices, 1 Tbsp of olive oil, sage, coriander, salt and pepper. Let stand 30 minutes to an hour. In a small saucepan over medium heat, combine syrup, butter, additional salt and cumin. Simmer for 3 minutes. Toss mixture with squash slices. 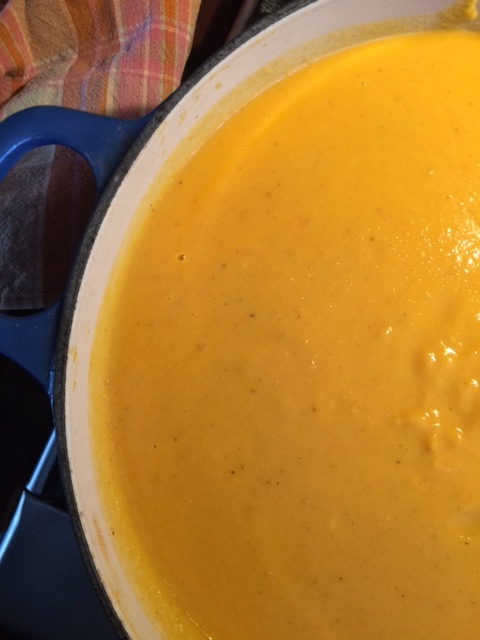 Spread squash in a 9×13 inch pan. Nestle chicken and lemon on top of squash. Roast for 30 minutes. In a small bowl, toss scallions with 1 tsp of olive oil. 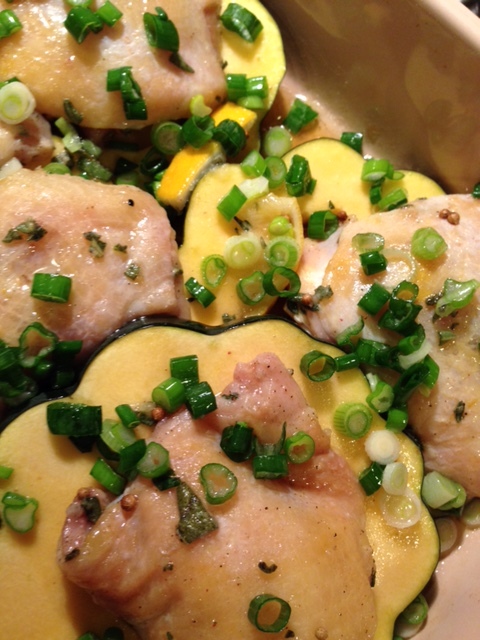 Scatter over squash; keep roasting until chicken is no longer pink, about 30-40 minutes more. 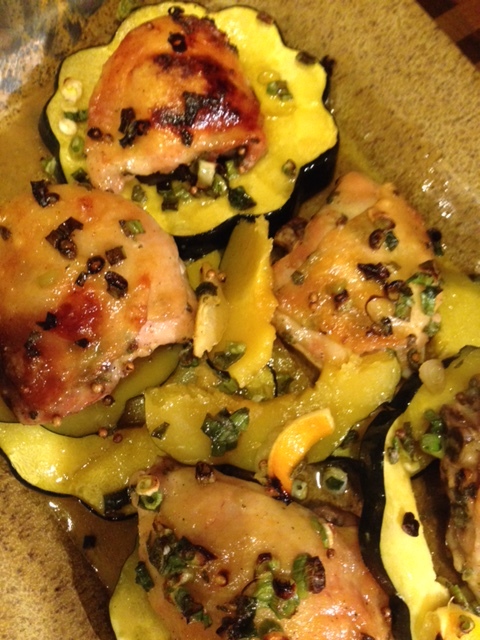 Savory combination of squash and chicken. Can we talk? I mean really talk? I love liver…always have. Maybe it’s my German heritage. I know, I know, some of you have to get past the yuck factor; but when you get past all those toxic thoughts, you’ll learn it is one of the most nutritionally dense foods you can eat. Yet how do I convince all you skeptics out there? After all, its been appreciated for thousands of years, and recently advocated by Paleo enthusiasts. Why, its developed a bit of a cult following. So let’s start by stating some nutritional information. Liver actually contains, gram-for-gram, more nutrients than any other food! Another misconception is that liver stores the toxins and therefore is not safe to eat. It is true that liver is a detox organ. But it is not true that liver is where the toxins are stored. What it does store is a motherlode of critical vitamins, nutrients, and antioxidents. These are what help the liver get rid of the toxins in the body–not trap them inside. One caveat I do strongly suggest is insisting on grass-fed liver from pasture-raised chicken or cows. The term “you are what you eat” does not only apply to humans. So there it is…I suspect that if you were inclined to eat liver before, you will continue. 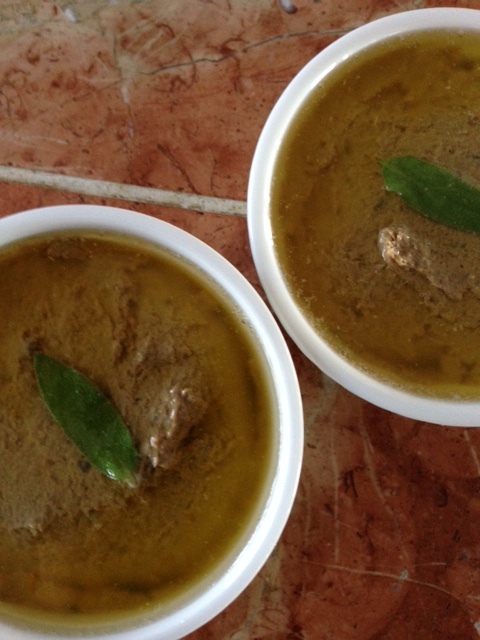 If you have never tried liver, I urge you to give this recipe a shot. It’s savory, rich and delicious. Who knows…you might just like it. Melt first 3 Tbsp of ghee in a large skillet, over medium-high heat. 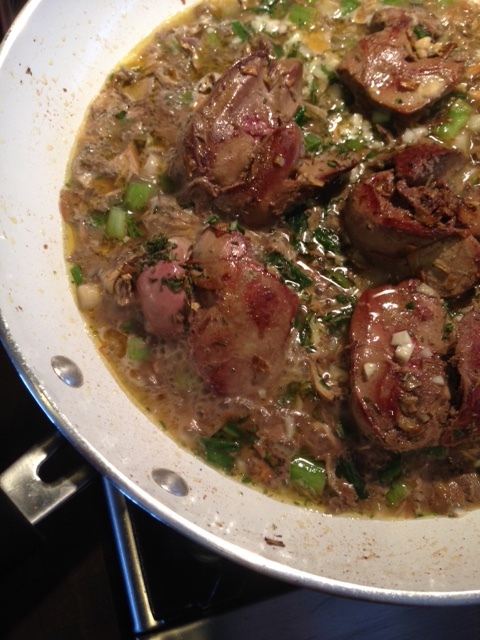 Add the livers, onions, and mushrooms and cook, stirring occasionally, for about 10 minutes, until the livers are browned. Add the garlic, vermouth, mustard, lemon juice and rosemary. Bring to a boil and cook, uncovered, until the liquid is gone. Allow to cool. Process in a food processor with 1/4 cup of ghee. Season with salt to taste. Place in individual ramekins or mold, pour melted ghee over top to preserve. Cover with plastic wrap and chill at least 2 hours. Freeze additional ramekins for future use. Serve with crackers, coarse mustard and pickled red onions. I’ve lived most of my life as a Michigander. I love how the seasons change the landscape in front of my writing area. Today the stillness of winter has struck just the right cord within me. I feel the warmth of the wood-burner,and the sounds of Val getting our morning coffee. I watch the birds at our feeders, their small feathered body’s puffed out against the cold. In that stillness, resides a sense of gratitude and the accumulative effect is one of peace. This inner peace is much needed as we head into the next phase of my physical journey. I have been referred to a hematologist for a bone marrow biopsy and thorough blood workup. A suspected blood disorder is looming large. Again, we learn patience and perseverance. Val built our home on 52 consecutive Sundays; you can feel the love seeping through the structure. This is our house of God. It is a home that has seen much history and celebration. Today our neighbor Lynne, my older brother Bill and his girlfriend Deb are coming for dinner. There are few things I enjoy more than filling our home with the scents of cooking and the anticipation of sharing that meal with those I love. Good food is often like that, an invisible bridge connecting us to each other. An expression of goodwill that transcends the simplicity of the moment into something larger, more intimate and we bask in its warmth. 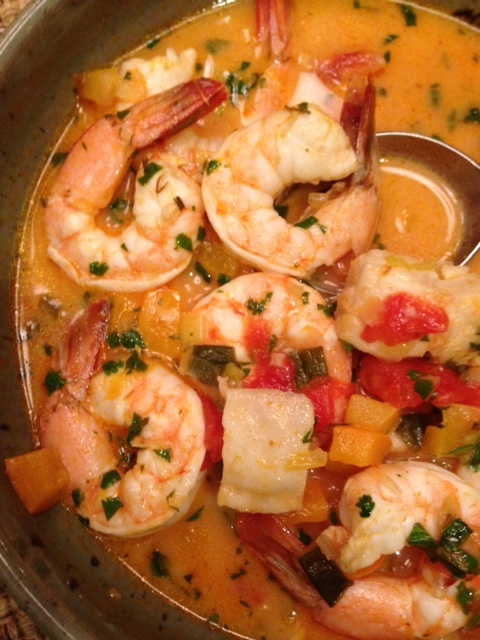 Today’s meal will be a wonderful Brazilian fish stew called: Moqueca De Peixe. With aromatic garlic, onions, cilantro and red bell pepper, it has just the right amount of heat, which is tempered with the addition of coconut milk. Loaded with tomato, fish and shrimp, it is a big bowl of warmth. It invites you to eat the shrimp floating in the broth with your fingers. I smile when I see Bill’s eyes closed with enjoyment. This is why I cook. Combine the first 6 ingredients in a large bowl and set aside. Add the ghee or olive oil to a large soup pot over medium-high heat, add onion and saute until soft, stirring occasionally. 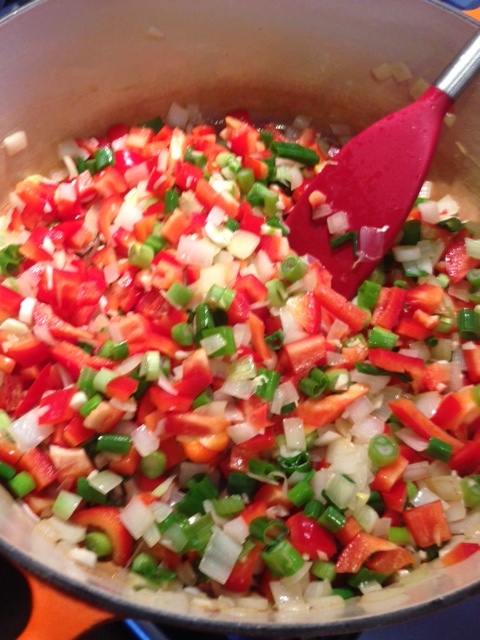 Add the red bell pepper, green onion, garlic and bay leaves. Saute for 10 more minutes or until vegetables are softened. Add tomatoes and tomato paste, combine well and cook for another 5 minutes. Add the chicken and fish stock or clam juice, along with the cilantro and simmer until hot but not boiling, about 10-15 more minutes. Finally, add the coconut milk, fish and shrimp, including their marinade. Cook until shrimp looses its opaqueness, about 3 minutes. DO NOT OVERCOOK! Ladle into bowls and garnish liberally with additional cilantro. Pass the lime wedges.